Saturday morning, April’s showers were plentiful, but as the dreary morning passed, they lightened up to an occasional sprinkle, then gave the Hopkinton Land Trust a break for a few hours, just enough for the hikers to gather by the banks of Tomaquag Brook, a half mile in the woods along the Grills Sanctuary’s Tomaquag Trail. 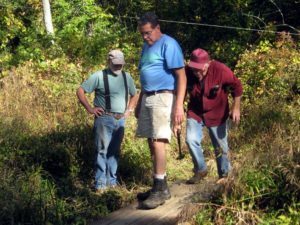 Most of those present knew the spot well, as they were among the many volunteers who constructed that trail, That 280’ Boardwalk over the brook’s flood plain, and individual piece by individual piece, built the “Main Event”, the 55 foot long Tomaquag Brook Bridge. When that work began, we wore tees and shorts. When it was finished, it was hats, hoodies and gloves. You can see the seasons change and the bridge rise out of the reeds on the web page “Grills Trail Bridge Progress” via over 400 photos and text. 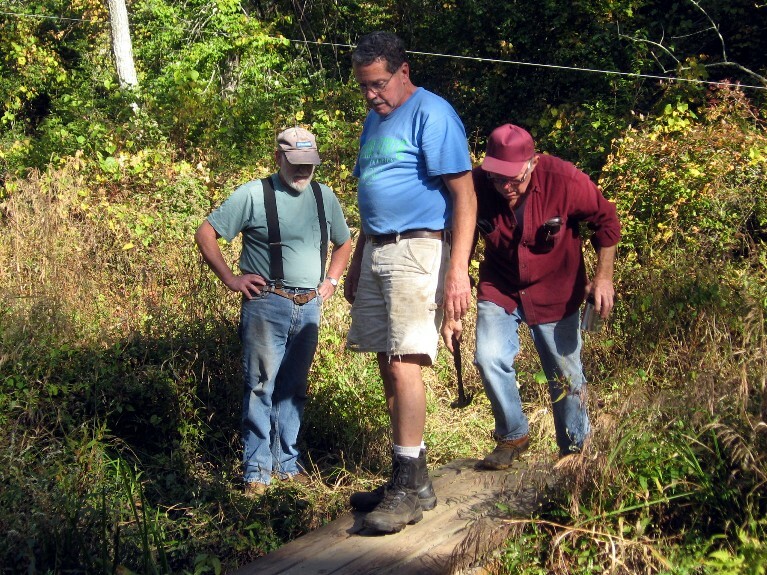 This day, Dedication Day, was a time to reminisce with fellow volunteers about last year working together, and to look with pride on what we accomplished as volunteers together, make a popular trail and “stick build” a bridge that has already been “flood tested & approved” by Mother Nature! Ed Wood, of HLT, was the first speaker. 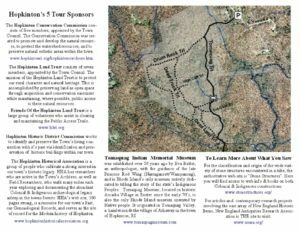 He was followed by Elizabeth Roberts, RI’s Lieutenant Governor, who left the pavement of Providence behind to hike the genuine dirt trail to Tomaquag Bridge. Marilyn Grant, President of HLT spoke last about the significance of what we did. She also took the time to thank us, and to single out Chris Anderson for her behind the scenes work with the group “Friends of the Hopkinton Land Trust”. In the audience, it felt like things were winding down, but Ed Wood came back to the center, and made a point of honoring Ted Dionne, going STRONG at 80, for providing the answers and sharing the “know how” gained in a lifetime of “getting things done right!”. The Ed surprised us all by announcing that the Tomaquag Brook Bridge would be dedicated to Harvey Buford, for his tireless work in planning it’s construction, and translating dreams into reality, overcoming what obstacles arose to get us to this day. In time, you will find that dedication inscribed on a rock, just before you cross the bridge. What follows are 5 slide shows, and then a special photo of Harvey, along with Rick Prescott, President of HHA, and Ted Dionne, “Chief Do-er Of Things”. The picture was taken the afternoon we placed the temporary bridges that the work crews would use to cross the brook as the bridge and boardwalk were being built. In that last picture, look for the white string above their heads. That string was Tomaquag Trail. Then it finally gave way to the bridge and boardwalk you can walk across today. But back then, when the photo was snapped, that string was only the promise of a fine bridge. In due time, Harvey Buford and all the volunteers working together made that string’s promise into reality. Thank you, Harvey, and all the volunteers that worked so hard together! All of you made this beautiful Trail come to life! This Spring, we will focus on the abundant ceremonial landscapes and individual ceremonial sites of the Narragansett Indians. 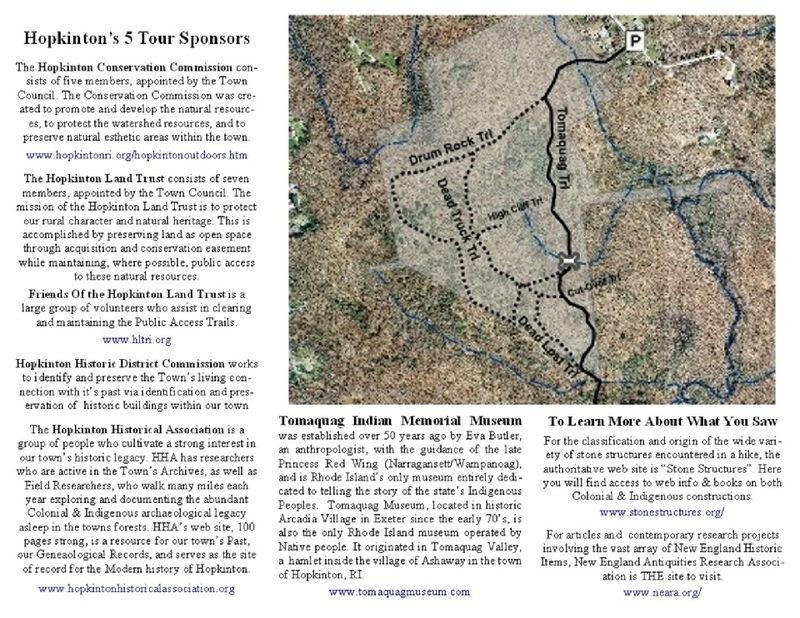 Because of the importance and content of the sites selected, Lorén Spears, the Director of, and Cultural Educator for the Tomaquag Museum in Exeter RI, joined in our planning. She agreed to speak about the ceremonial nature of the sites, how they were interwoven into the daily lives of the Narragansett culture, both in the past, and in the present day, and the importance of their preservation. This is a tremendous educational opportunity to “see” a variety of ceremonial sites, and then hear about how these things remain active spiritually in the Narragansett world view. If you live along the I-95 Corridor, you might consider making the trip to RI Exit 1, and the 2 mile drive to the parking area. As the brochure & photos make clear, the sites visited are well worth the trip! I personally have no knowledge about what other towns are doing. But I know when we five work together, we all stand a little taller! To other towns who want to try it: We have different assignments in Hopkinton, which require us to follow different agendas & budgets, but try doing one thing each year together. It means shrinking egos, lowering the volume, and reducing exclamation points, but it’s all for the benefit of the people of your town! At it’s core, the HHA Web Site is designed as a place of learning. The site stats, updated with each revision on the home page, show by their steady growth worldwide that you have responded to the explanatory articles and the site’s many pictures. But as the web master, I am aware that many of you have progressed beyond the basics we present, and desire to dig deeper into the nuts and bolts of History. Aware of my limitations, I began by approaching Norman Muller, an archaeologist, for permission to transcribe his research paper first published in the journal of NEARA, the New England Antiquities Research Association. The hits on this web page, “Reinforcing Hopkinton’s Evidence”, show that you are ready to encounter actual research documentation. Not only were you enthusiastic over “the real deal”, but the archaeological community was enthusiastic about being able to communicate with you! Two other archaeologists have granted me permission to publish some of their research papers as well. The HHA website is about local application, so where possible, I will insert photos of similar features spoken of in the articles shot in Hopkinton. As you can imagine, it will take me some time to prepare each page, but slowly the quantity of pages in “Digging Deeper” will expand. At first, the subject matter will be archaeology, the field where the initial break through occurred. But “Digging Deeper” will expand into history and natural history, both areas where there are many qualified researchers and professionals. Please follow your curiosity and dig deep! Stone Structures, James & Mary Gage – This site is encyclopedic in coverage of all things stone which you might find in field or forest, from indigenous to historic, from quarrying to construction. The NEARA website connects you to a body of information and research by amateur and professional archaeologists and their research. 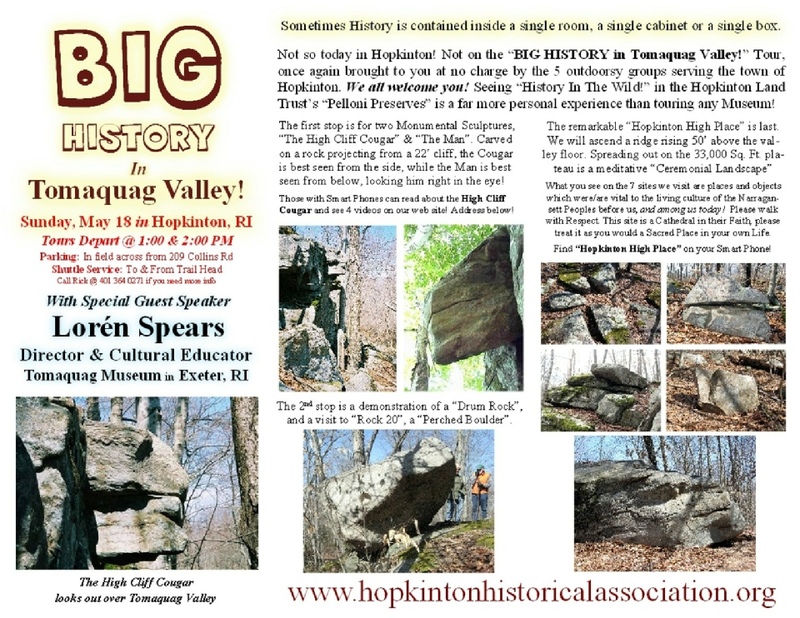 There is much here to satisfy your curiosity for digging deeper into the local Hopkinton and New England past.